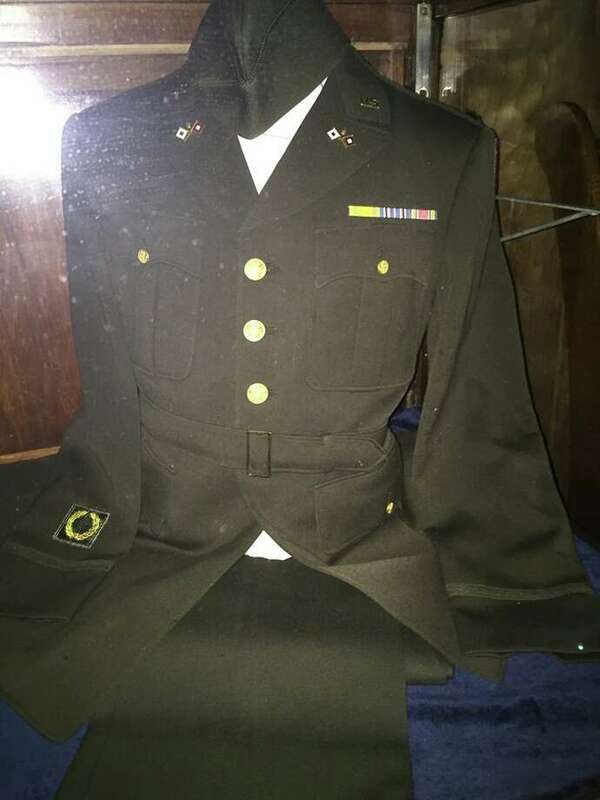 WW II Veteran Ralph Andermann‘s military uniform. Seventy-one years ago in September, World War II officially came to an end. Many Darien residents served in the military during this time and many died. The names of those killed in the war are listed on the Darien World War II memorial located at the intersection of Renshaw Road and Park Place, on the right when traveling west on Renshaw Road. The following Darien residents are listed on that memorial as having died in the conflict: Sanford Adams , Eric Allen , William A. Aycrigg II, Elton S. Barrett, Orrin K. Boice, James Butts, Joseph A. Chase, Peter T. Chester, Horace G. Cleveland III, Louis Cotaling, David O. Devlin, Anthony R. Frate, Donald Frothingham Jr., Raymond L. Howe, Pasquale G. Improta, Lawrence H. Isbell, Thomas W. Jenkins, Jefferson M. Johnson, John L. Masterson, George R. Miller, Alan R. Morehouse, Arthur L. Nielsen, William T. O'Neill Jr., Francis W. O'Toole, Otis Overton, Rosario F. Palumberi, Harold D. Parady, Kenneth C. Phillips, John Pyne, Louis E. Rayner, Thomas F. Rendler, David L. Rosenberg, Charles B. Rossi, Gordon S. Smith, Thomas F. Smith, Stephen J. Tansak, Torger D. Tokle, Julius W. Torok, Anthony Vitti and Clarence C. Walker. On Oct. 2, the Darien Historical Society will hold an open house from 1 to 3 p.m. They will be hosting a tribute to WWII Veteran Ralph Andermann, which begins at 1 p.m.. Ralph, a local resident and direct descendant of the pioneer Andermann family, was chosen by the U.S. Army to help develop radar technology during World War II. Following his story will be a question/answer opportunity as well as viewing time at the Old Lace Schoolhouse and Museum. The year World War II officially came to an end.